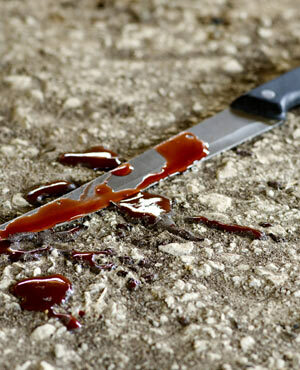 Johannesburg - A man was stabbed to death in front of his daughter in Kwanobuhle, Uitenhage, police said on Sunday. Johannes Mlanyavi, 56, was walking with his 21-year-old daughter near the airfield between Kwanobuhle and Uitenhage when two men approached them at 10:30 on Saturday. "They threatened them with a knife and demanded money and their cellphones," said Lieutenant Colonel Priscilla Naidu. "Mlanyavi gave his wallet containing R200 and as he was about to give his cellphone, the one suspect started to stab and assault him," she said. The men took Mlanyavi's daughter's cellphone, then ran away. Mlanyavi, who was stabbed in the head, arm and chest, collapsed and died, said Naidu. Meanwhile, police in Uitenhage were looking for two men who robbed a family of, among other things, Kruger Rand coins, old South African currency, jewellery, and laptops worth R537 000 on Friday afternoon. Naidu said the men forced their way into a house in Fairbridge when a woman answered their knock on the door. They held the family at gunpoint. The family was ordered to lie on the floor while they ransacked the house," she said. The men stole Kruger Rand coins valued at R500 000, old South African currency totalling R30 000, jewellery, laptops and other household items. "Police are appealing to the public not to buy these items because if they are caught with them they will be charged for receiving and buying stolen items," she said.